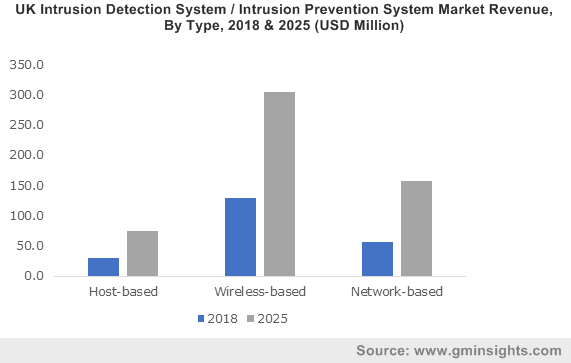 Intrusion Detection System / Intrusion Prevention System (IDS / IPS) Market size estimated at USD 3 billion in 2018 and is growing at a CAGR of over 12% between 2019 and 2025. The rising security threats, fear of data breaches and consistently changing regulatory landscape have resulted into the rapid development of IDS / IPS. The growing number of cyberattacks in enterprises such as malware, ransomware, and Denial of Service (DoS) have the ability to compromise the existing security systems in an enterprise. These security breaches have long-lasting and damaging effects in the enterprise in terms of regaining customer trust and rebuilding relationships. Hence, organizations worldwide have adopted improved security systems driving the demand for intrusion detection system / intrusion prevention system market. Companies are adopting IDS / IPS devices to monitor their system and user activities, analyze system configurations and vulnerabilities, assess file and system integrity and track user policy violations. These companies are investing in R&D to enhance the efficiency of these systems for transforming their businesses and mitigating cyber threats. Various financial institutions, government agencies, healthcare and IT & telecom are the major industries investing in the intrusion detection system / intrusion prevention system applications with the cybersecurity expenditure expected to exceed USD 1 trillion between 2017 to 2021. The rising penetration of smart phones and tablets and growing demand for employee mobility software and mobility service management are also driving the demand for IDS / IPS solutions. Companies encouraging BYOD are implementing security policies to strengthen their BYOD network components by enforcing granular access policies across tablets, laptops, and other mobile devices driving the intrusion detection system / intrusion prevention system market demand. For instance, by adopting intrusion detection system such as Snort the user gets an alert in case of an unauthorized access or suspicious activity at the workplace in real-time. The solution market accounted for a share of over 64% in 2018 and is projected to dominate the IDS / IPS market over the forecast period. The large-scale adoption of intrusion detection system / intrusion prevention system solutions due to the advanced capabilities they offer such as data loss prevention, web application firewall capabilities and denial-of-service prevention drive the intrusion detection system / intrusion prevention system market growth. Companies are also working towards developing advanced features of the IDS / IPS solutions to further expand the security landscape of an organization. For instance, in June 2018, Cisco introduced its beta version of Snort 3.0 with advanced features offering deep packet inspection and protection capabilities. The host-based IDS / IPS is anticipated to grow at the fastest rate growing at a CAGR of over 15% between 2019 to 2025. This system has the ability to monitor vital system files of a host, analyze running processes, user’s logon activities, data integrity and other related intrusions into the system. In case of an unauthorized activity the system blocks the activity or informs the user thereby preventing attacks on the server. The system can also detect local events on a host system thereby detecting attacks that may elude from a network-based intrusion detection system / intrusion prevention system. A major challenge encountered by the host-based IDS / IPS include its capability to get compromised as soon as the host server is compromised by an attack. Additional R&D will assist companies in overcoming the shortcoming leading to higher demand of the system over the forecast timespan. The cloud-based deployment model is predicted to witness the fastest growth in the intrusion detection system / intrusion prevention system (IDS / IPS) market. The cloud-based IDS / IPS is essential for enterprises migrating their services and workloads to public cloud infrastructure such as Microsoft Azure and Amazon Web Services. They offer enhanced protection to organizational data by detecting suspicious activities based on malicious behavior or predefined signatures by monitoring and examining network traffic flows. Furthermore, the SMEs are focused on reducing their IT costs and managing the security in their cloud environment by adopting IDS / IPS driving the market adoption. The aerospace and defense sector dominate the intrusion detection system / intrusion prevention system market with a market share of over 30% in 2018. The emerging technologies, changing nature of war, and growing reliance on cyber are the major factors contributing to the market growth. The cyber-attacks in the aviation and defense sector have far more detrimental and dangerous effects as compared to other industries considering their economic impact, psychological impact on people, damage of property and its propaganda of exploitation. Hence, government worldwide are making strategic investment in these sectors to make use of technologies for making the sector more advanced and secured. For instance, in January 2019, the Tamil Nadu government in India announced its plan to invest USD 15 billion in the defense and aerospace sector over the next 15 years. Such investments enable the defense sector to adopt advanced threat intelligence solutions driving the IDS / IPS market growth. 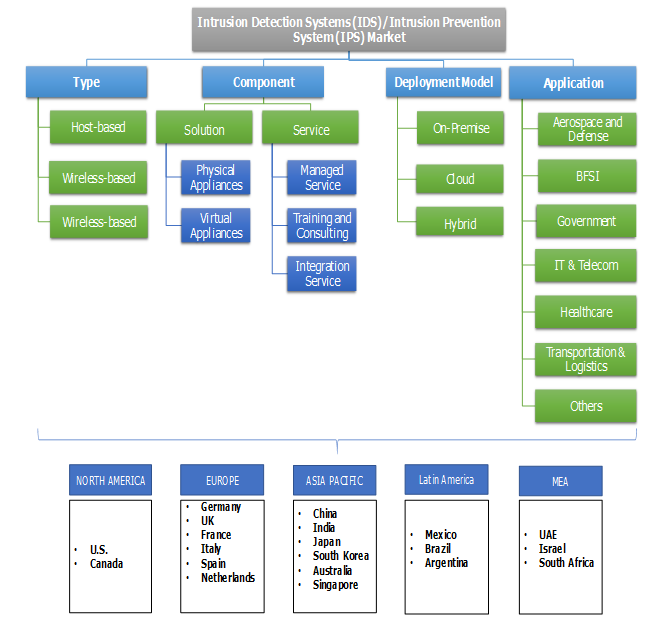 North America leads the intrusion detection system / intrusion prevention system (IDS / IPS) market with a revenue of over USD 1.5 billion in 2018. The rising adoption of connected devices such as IoT, BYOD and cloud computing along with an upsurge in the usage of mobile applications are the major factors contributing to the market growth. 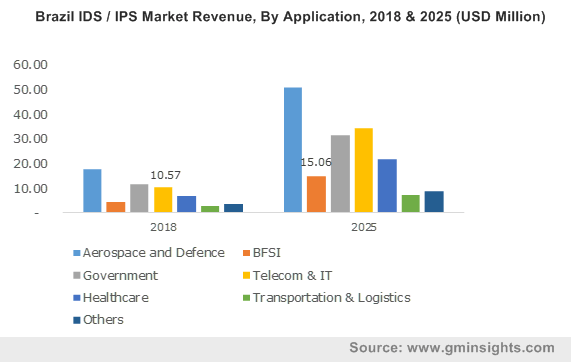 The presence of key players of the market such as Cisco, IBM, and Juniper Networks in this region is contributing to the growth of IDS / IPS market. The U.S. dominates the North American market due to factors such as the adoption of advanced technologies to enhance the security features of the organizations. In 2017, the federal civilian agencies reported over 35,277 cybersecurity incidents which included web-based attacks, phishing attacks, and loss or threat of computing equipment. In 2016, the number of data breaches in the U.S. amounted to 1093 with close to 36.6 million records exposed. These increasing number of cybersecurity attacks and data breaches in this region has accelerated the adoption of IDS / IPS solutions amongst enterprises. The companies functioning in the intrusion detection system / intrusion prevention system market focus on adopting advanced technologies for new product development in turn augmenting their security solution portfolio. The companies are entering in strategic partnerships and collaborations to augment their global footprint and meet specific customer requirements. For instance, in April 2018, Symantec entered into a partnership with NTT Security aimed towards strengthening their cybersecurity initiatives. This partnership will augment the web application security service offerings to users across on-premise, cloud and mobile. The key vendors operating in the IDS / IPS market are Cisco, IBM, Trend Micro, Juniper Networks, Extreme Networks, Symantec Corporation, Sophos, Dell, McAfee, HP and Huawei. 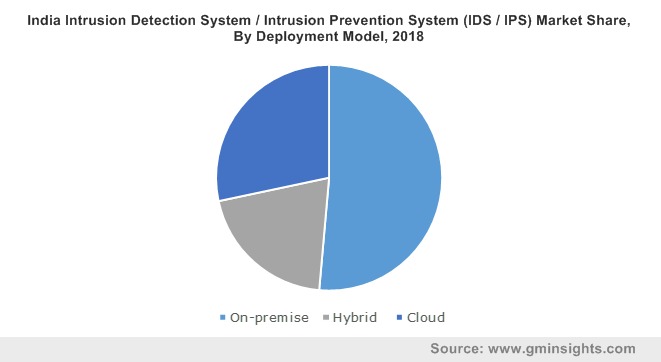 The growing trend of digitalization and adoption of advanced technologies such as cloud computing, AI, and IoT are the major factors contributing to the demand for intrusion detection system / intrusion prevention system (IDS / IPS) market. Various security loopholes and weak IT infrastructure have enabled organizations to adopt next generation IDS / IPS driving the market growth. Companies have adopted the strategy of new product development and regional expansion to drive market innovation and serve a larger customer base.